This post is another example of how good very simple dishes can be. 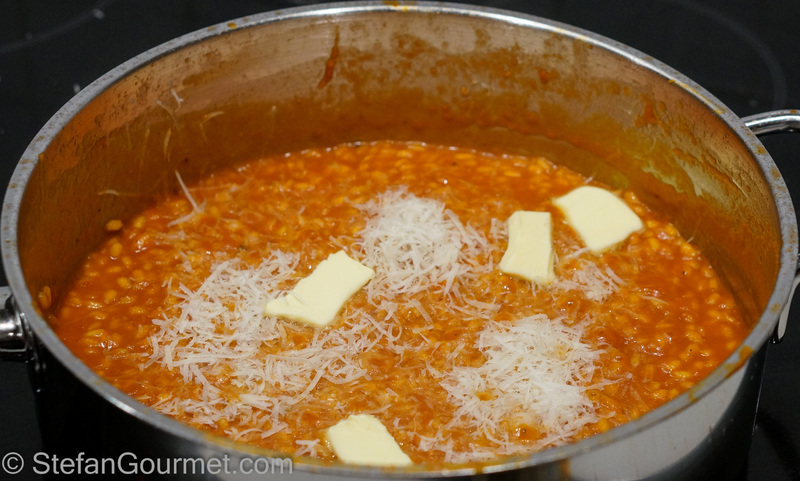 I had never thought of tomato risotto, and saw it for the first time on Le Ricette di Baccos. I tried it, and it was absolutely wonderful. What a great flavor! Grazie per aver condiviso, Marina! 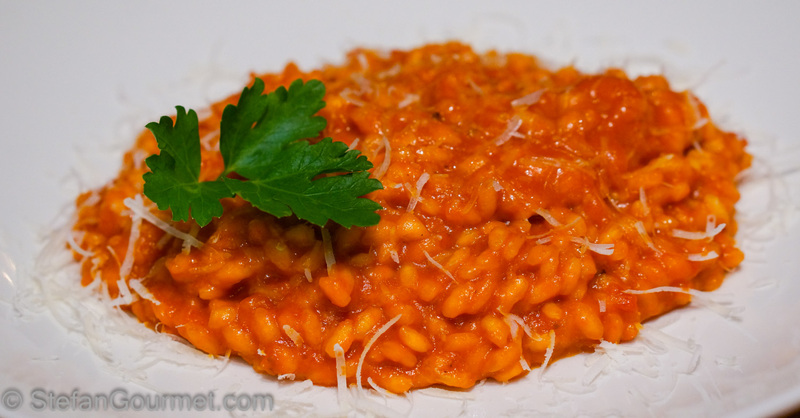 This risotto really allows the tomato to shine and if you are blessed with good tomatoes, by all means use them. If not, use good quality canned tomatoes. 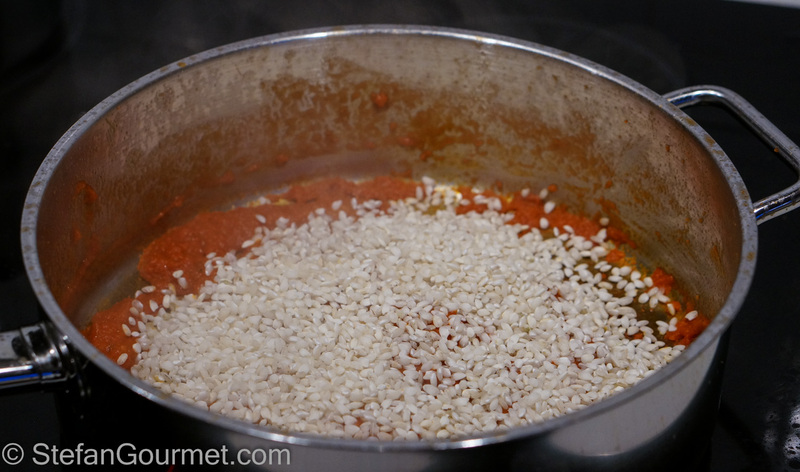 The flavor of the tomatoes is enhanced by cooking a tomato sauce over high heat before adding the rice. Variations are possible such as adding an onion and white wine, but just the simple version is amazing. Give it a try! 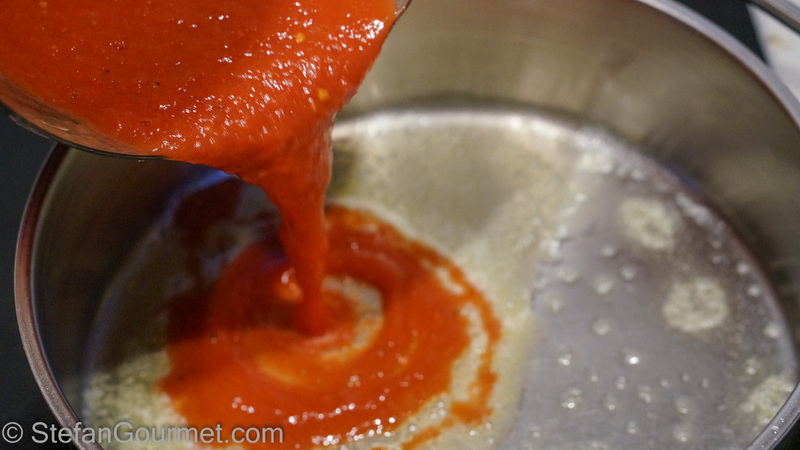 Puree the tomatoes in a food processor. 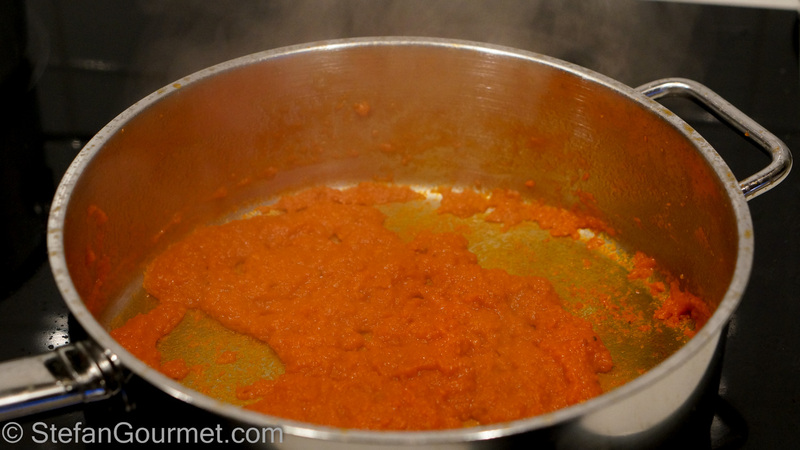 Melt 2 Tbsp of the butter in a wide thick-bottomed pan and add the pureed tomatoes. Season with salt. Cook over high heat, stirring. 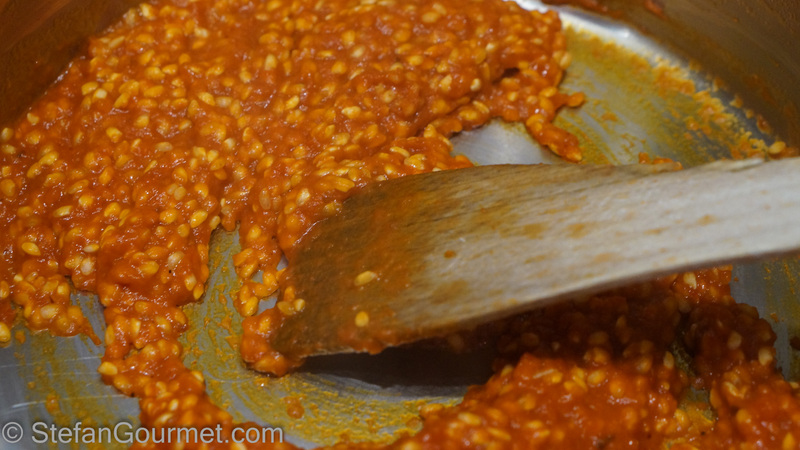 Lower the heat as much as needed to prevent the sauce from splattering all over the place. 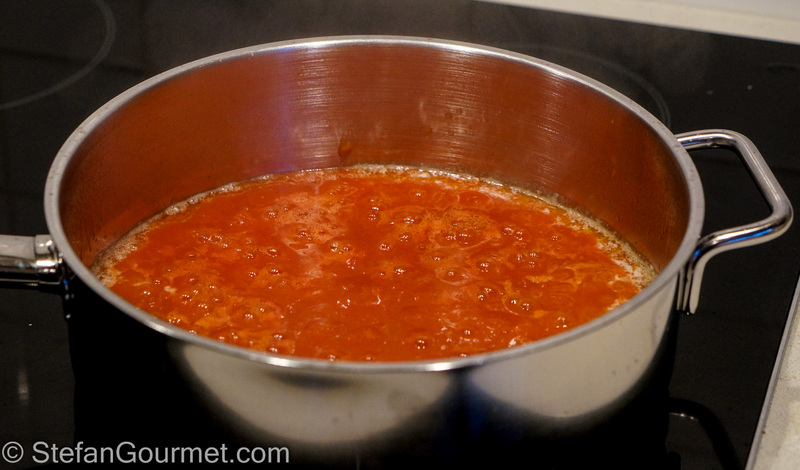 Keep cooking and stirring over high heat until you have a thick tomato sauce, about 10 minutes. Meanwhile, bring the vegetable stock to a simmer. Lower the heat to medium. Add the rice and stir. Cook for a few minutes until the rice is hot. Add a ladle of simmering vegetable stock. Stir until it starts to become dry. 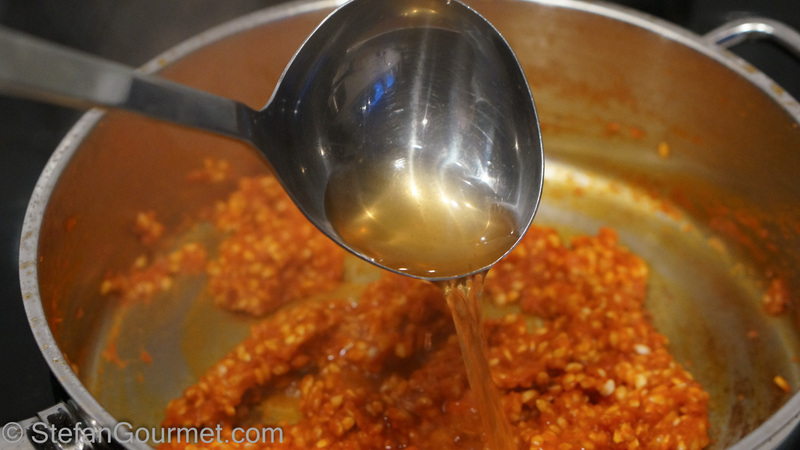 Then add another ladle of stock and keep stirring. Repeat until the rice is cooked, about 18 minutes. Use hot water if you run out of stock. Taste the rice to check whether it is done. Risotto should have a bite (al dente), but the rice shouldn’t be undercooked either. Turn off the heat. Add the remaining Tbsp of butter and some freshly grated parmigiano reggiano. Stir until the butter and cheese have dissolved. Allow to rest for a few minutes before serving. Serve on warm plates, garnished with fresh basil or parsley and sprinkled with some more freshly grated parmigiano reggiano. Tomatoes and wines from sangiovese grapes are friends because of their shared acidity. Sangiovese is the primary variety used to make Chianti, so a medium bodied Chianti Classico would be a nice option. Especially when using fresh tomatoes, a full bodied rosé made from sangiovese might be an even better choice. 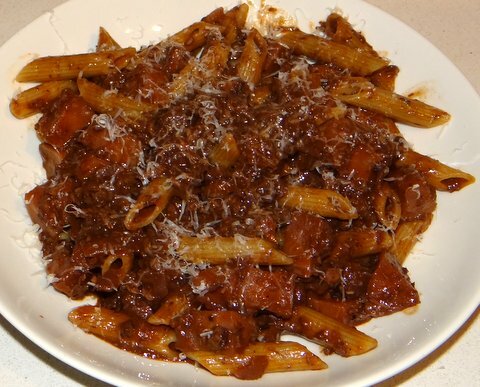 Two years ago I tried a recipe from a fellow blogger (whose blog sadly has closed down after she became a mother), a parsnip and beef ragù. It was very nice and this flashback reminds me that I should make this again. Spero ti sia piaciuto. L’aspetto è perfetto. Ci è piaciuto davvero! Lo rifarò di sicuro. My grandmother used to make this (or something like this) … and so this recipe brings many a proustian memory. Thank you Stefan! We’re trying a mushroom risotto tonight with our dinner group – a Mediterranean theme. I should be cooking right now!!! 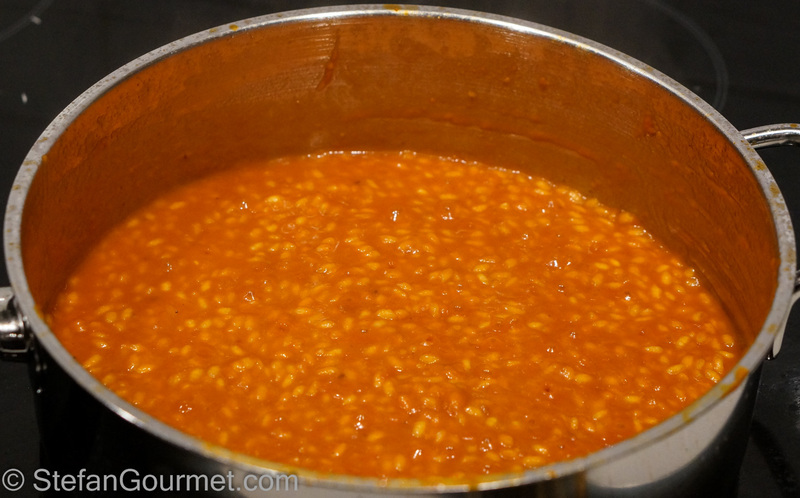 I made a tomato risotto for my mother some years back and had forgotten about it. I used fresh tomatoes that I peeled. Thanks for reminding me! It looks delicious! Delicious! 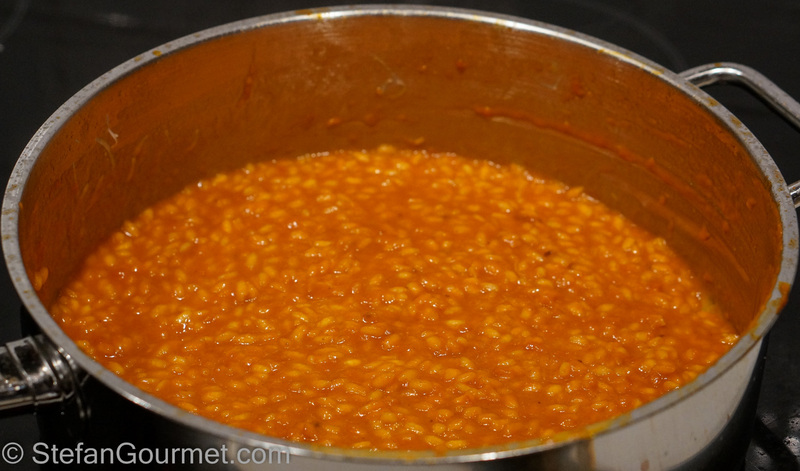 I make a similar simple tomato risotto which is our favourite. The leftovers are delicious with a poached egg on top. Absolutely beautiful!! In the same class as pasta con aglio e olio!! Simple and so oft repeatable!! With reasonable tomatoes available most of the year Down Under [and oft dirt cheap and of very good quality] I do prefer the ‘real’ if I can!! This looks amazing, Stefan! Love risotto al pomodoro! This looks beautiful Stefan. It is really lovely. The Italian flag colours have something to do with it.